This is a Lord Vishnu temple located in Kanyakumari District of Tamil Nadu, India. The date of construction is not clearly known but the most recent renovation was done by the king Kulasekhara in the seventeenth century. This is also a fine example of Dravidian style of architecture built in an area of 2 Acres. Some of the oldest artifacts of the temple date back to 1139 AD. 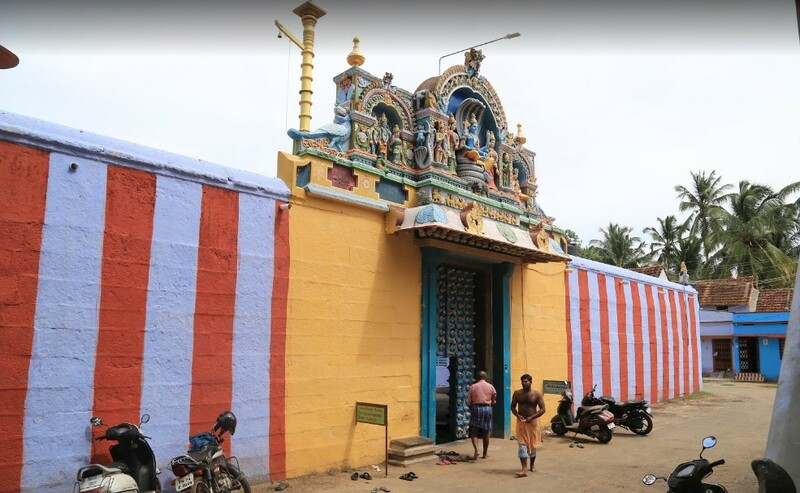 There is a beautiful legend associated with this particular temple, which is located not more than 4 KM from Nagercoil. It is observed that Lord Vishnu is in sitting position inside the temple. The other three idols that are seen there are of Lord Rama, Lakshmana and Sita. There is a big tank inside the temple premise and that is believed to have miraculous power to heal from various diseases. This tank is known as Somateertha. Once upon a time the seven saints known as Saptarshis were meditating and they were given a visit by Lord Shiva, on whose advice they moved the North West, did a hard penance and obliged Lord Vishnu to appear in front of them. Once that happened, as part of a boon they requested Lord Vishnu not to leave that place and that is how the temple got into being. According to another legend, Goddess Lakshmi was taken by surprise by seeing Lord Vishnu in the form of Narasimha which scared her away. Prahlada went searching for Lakshmi after the end of Hiranyakashipu, he found Godess Lakshmi at this particular place. She was very happy and obliged him by taking her rightful position at Lord Vishnu’s heart. The idol of the temple is made of mustard and jaggery paste and that is why the ritualistic bathing of this statue is never done here. Lord Vishnu has got Lakshmi in his chest, which is rarely seen in present day India. The deity is adorned with a crown of gold which also had lots of diamonds and other precious stones, but those were stolen. The deity is astounding 9 feet tall and is surrounded by the paintings of the 10 incarnations of Lord Vishnu. the Vaishnava faith. Not only that, six daily rituals take place over there and a great deal of yearly festivals are held in this temple as well. The most famous of them is called the Chittarai Brahmotsavam in the month of April-May. During this festival these deities are taken out of the temple and become a part of a large procession on a chariot in the streets. This celebration goes on for ten long days. The next one is called Adi Swati in the month of September-October. The Vaikuntha Ekadasi is the celebrated with most fanfare. There are weekly, monthly and fortnightly rituals in the temple. Since there are plenty of festivals and rituals going on through the year, visiting the temple anytime of the year is a real joy. Thiruvanparisaram Kuralappa Perumal Temple is opened for visitors every day at 4.30 am. – 12.30 pm. and 5.00 pm. – 8.00 pm.